Assassins, Aristocrats and Archbishops take center stage this month for what is gearing up to be quite a murderous March in San Diego’s theatre scene. But do not fear! In addition to an exciting evening of black humor or musical madness, a night out at the theater means taking in some of San Diego’s most iconic neighborhoods such as historic Old Town, beautiful Balboa Park, and energetic Downtown. Bold, original, thought-provoking and alarmingly funny, Assassins lays bare the lives of nine individuals who assassinated (or attempted to) the President of the United States, including the infamous John Wilkes Booth and Lee Harvey Oswald, in wry musical form. Music and lyrics by Stephen Sondheim, book by John Weidman, Directed by Sean Murry. Will Monty Navarro become 1st in line to inherit his dukedom? When Monty Navarro finds out he is ninth in line to inherit a dukedom, he decides to eliminate the other eight heirs (all played by one incredible actor!) 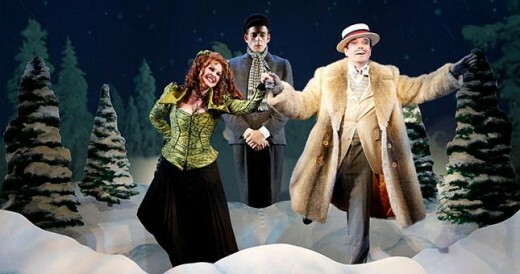 standing in his way in this World Premiere musical of merriment and murder. This witty music hall comedy explores just how low we’ll go to make it to the top! 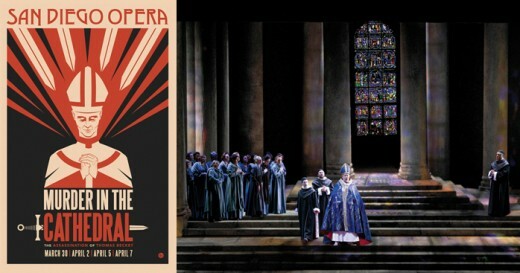 The American West Coast Premiere of Murder in the Cathedral comes to the San Diego Opera with a score reminiscent of Puccini and extraordinary choruses perfectly able to paint a complex story of faith, passion, tragedy and hope. Archbishop Thomas Becket, brutally murdered in Canterbury Cathedral in December 1170 defending his church against the intrusions of King Henry II, became a Christian martyr and Saint at whose tomb Henry was forced to pay penance. Based on the T. S. Eliot play, the opera, by Ildebrando Pizzetti, covers the last month of Becket’s life as he struggles with politics, religion and temptation.